Ed Brubaker writes great stories. The trouble is that sometimes, as is the case with Captain America, he seems more interested in telling a good story than in telling a story about the character he's supposed to be focusing on. I had real problems with his first Cap arc, The Winter Soldier, because he did the unthinkable in bringing back Bucky. The story was well crafted except for the cop out at the end involving the villain, but the idea that Bucky was back really bothered me. It still does but I'm more or less getting over it as I come around to the idea that neither Marvel nor DC are going to leave things alone anymore. What I wonder, though, is this: With comic book readers growing older, trades taking over, and kids not reading comics, is taking these books further and further away from their source material really a good idea? Do new readers not happen because they're bored with the "old" stories or is it because the new stories are turning them off? Only time will tell that, but I wonder sometimes as I notice less people at the comic book store. As just about everyone knows by now, Cap goes against registration and goes ape on S.H.I.E.L.D agents, forming a resistance movement until such time as it becomes apparent to Steve that fighting is pointless. What you only know by reading this is that a) the resistance got quite a bit of help from Nick Fury, b) Maria Hill tried to use Sharon Carter to rope him in, further proving she's an idiot, and c) the Red Skull is using this all to his advantage. While Cap tries to keep an eye on the Skull's activities, he stays in love with Sharon, who turns on her bosses to help him. 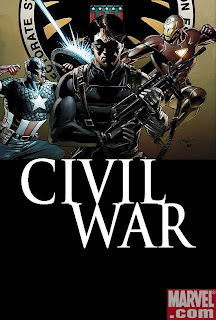 Fury, who's in hiding after the events of Secret War, uses the Winter Soldier (aka Bucky) to help him get an in at S.H.I.E.L.D, and by the end, we're left wondering how low Tony may have sunk, we get to see two old Cap villains show up to help the Skull, and I continue to note that Bucky and Jason Todd are now apparently one and the same in terms of their characterization, which is a damned shame. There's also a Winter Soldier one-shot in here that's a nice story of Bucky trying to fit back into the world of heroes, fighting alongside what remains of the Young Avengers. I was really moved by the idea of Bucky feeling responsible for Jack Monroe, and that's just the sort of thing I mean when I say that Brubaker writes great stories that I wish hadn't messed with some things I don't think should ever be touched, like the death of Cap's partner. Both storylines are top notch in terms of writing and art--Perkins even gets a Spirit tribute splash page snuck into things--but my only real problem is that there's just not enough Cap for my taste. It's like he's a guest star in his own book here, and given what comes next, that's a damned shame. Still, this is exactly what a tie-in should be, and if I were to hold a clinic on how to do a tie-in the right way, I'd show my students this trade. Brubaker doesn't rehash what we already know, a frequent mistake in these situations. We get to see characters that are important to the book but not maybe the whole Marvel Universe(Dum Dum, Sharon Carter) react to the events which are going on around them, and we even get a continuation of the "normal" subplots, weaved almost seamlessly into the crossover. That's how you do it, and it happens so rarely now that I have to call Brubaker out for it and give him props, especially when he shows how happy the Skull is that the heroes would rather fight each other than the "real enemy." I still wish Bucky was dead, but if he has to be alive, like Winnick's handling of Jason Todd, this is done rather well and I can make my peace with it. Those with less ties to old stories should have no trouble at all.